"Oh, dear, we're running out of games to play, Ruby! What now?" Gilbert carefully counted the Neopoints in his pouch as he sat down on a step of a staircase, with Ruby hovering above him. They had played every single game thinkable for the past three days, but only managed a mere three thousand Neopoints. It was, as Gilbert put it, not even enough to for them to buy the handle of the paintbrush. "I'm never going to return to my Scorchio self!" Gilbert sobbed, ignoring for once his image as the masculine Neopet. After all, he was but a silly Poogle now, and what image was there to keep? "That's not going to help. Penny was the one who told me to go solve this problem myself. And, as I already pledged, I would never go enlist her help. Wouldn't it be so embarrassing if I went begging her now?" Ruby sighed. Gilbert, after all, was still the proud chauvinist that he was. "Then now what? Neopoints come falling from the sky or growing on trees, you know." Suddenly, a stroke of genius came upon Gilbert. "Hey…wait a minute. Neopoints do grow from trees! Lets head to the Money Tree!" The sun was on the verge of slipping below the vast horizon. Gilbert and Ruby had been waiting at the Money Tree for nearly five hours, and their little patience was waning, but they had yet to lay their hands on any thing more than a mere palm fan. "This is useless." The worn out Poogle moaned irritably, frustrated at the sight of yet another Neopet snatching off a bag of 50 Neopoints. Tired of having to fight tooth and nail for a pathetic five-Neopoint note (only to lose it to the other party each time), and having to get out of the way of the frequent ghosts, the both of them leaned resignedly on the tree and slumped down to the ground, weary of the experience, unwilling to move another muscle. "I'm tired and hungry," Gilbert whined. "We'll just wait five more minutes, alright? I don't want to return empty handed after spending so much precious time here. I assure you we'll really be quitting this tiresome exercise as soon as the five minutes is up." Ruby was getting exhausted by it as well-but she was determined to help Gilbert out. He was, after all, the Neopet that set her free from her glass cage, whatever motive he may have. The blue Poogle groaned at the prospect of having to endure more of this absurdity. To have to run around grabbing silly bags of money, to make a fool out of oneself fighting over an old boot or a bottle of useless sand, was even worse than having to beat the Punchbag Bob up, and Gilbert felt it most acutely right then. Just when they felt all hopes was lost, a kind-hearted yellow Poogle came forward and dropped a 500-Neopoint bag next to Gilbert. The bag seemed purposely placed within an arm's length of him-as if it were just for blue Poogle. "It's for you," the feminine yellow Poogle gushed shyly. "I have seen you here since this morning, and thought this might be of some use to you. My mother always taught me to lend a helping hand to fellow Poogles, so…" The Poogle was literally blushing bright red. "Oh, thank you so much!" Gilbert looked gratefully at her. He glanced at the overjoyed Ruby and grinned. "We really needed it. Thank you, really!" As he stepped over to pick the canvas bag, he noticed another outstretched paw reaching for it. Looking up, he saw an aged, wrinkled face. 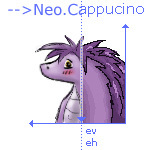 It belonged to an old female Neopet (whom Gilbert vaguely made out as a Ruki) who wore unkempt, tattered rags, and who looked severely underweight and malnourished, possibly because of her obvious poverty. As Gilbert's gaze met with her moist eyes, and as the last gleam of sunlight danced across her green face, it highlighted the creases and wrinkles on her face, and hinted a glimpse of tear. Gilbert and Ruby exchanged hesitant looks. Both looked piteously at the elderly Neopet, and, with a wordless consensus between the two friends, the Poogle picked up the bag, handing it over to the old Neopian. "Here you go," Gilbert said as her feeble hand gripped the bag thankfully. "I only want the Neopoints, but you'll really need it. Don't thank us, though. It's what we should be doing." With that, Gilbert marched smartly off, with Ruby hovering proudly behind him, while the small crowd that had gathered at the Money Tree looked on with reverence. "And so the both of us came home empty-handed," Gilbert concluded, with Penny looking wide-eyed at him. It was night, and the two friends had returned home, settling down finally after a whole day of game playing and Neopoint earning, and had just replayed everything in the form of words for Penny's curious ears. "That was quite an adventure indeed. In fact, these past few days was such an adventure for you, I don't think I can believe it," the owner said, shaking her head as the dubious story slowly sunk in. Ruby retorted in her barely-audible voice, "It really is true, Miss Penny! Every part of it! Even the part about me being released…I'm standing-well, hovering-right before your eyes, see?" In a gesture to erase any of Penny's doubts, she flew around the house. "See?" Penny giggled uncontrollably at the sight of the faerie fleeting around. "But I can't do anything even if I believe you. I spent so much money on that magical Poogle toy that I'm completely broke now. Broke, and stuck with two unhappy and unsatisfied pets, in fact. One deprived of his rightful chance at a change of species, the other desperately trying to change back to what he was. And besides, I thought I remember how someone once swore never to render my help in any circumstances…" Speaking teasingly at Gilbert, she chuckled again. "But, Miss Penny, we're in a plight right now-"
"It's alright if she's unwilling to help, Ruby," Gilbert stood up, as if firm and certain of his own abilities. "We'll be able to get out of this by ourselves." "Well then we will see how you are going to do it," Penny said, smiling, strolling into her room with her baby pet in tow. "I'm not trying to kill your confidence, but think about it. Certainly you'd realise that all this trouble boiled down to your own childish behaviour in the first place? If you hadn't been so jealous of Ben, you wouldn't even have to go through all these now." When Penny and Ben were gone, Gilbert looked down at his blue paws in shame. Penny was right. He did let his jealousy get the better of him that afternoon, and it really seemed it was his fault for all that was happening right now. He had indeed brought it upon himself. But Gilbert did not let such thoughts linger in his head for long. He had more important things to take care of, such as thinking of how to earn enough money for the morphing potion he is sure of purchasing. Taking out his pouch for the umpteenth time that day, Gilbert fished for the Neopoints inside. Painstakingly counting every coin and every note, he heaved a deep, deep sigh. "At the rate we are going we will not be able to lay our paws on that morphing potion until I am eighty!" Gilbert wailed, utterly frustrated with himself. Why didn't I practise at the games when I was young, when Penny wanted to take me to the game rooms?, Gilbert regretted. His faerie friend could do nothing but to put a tiny arm on his shoulders, that he might not be so cheerless about it. "How can I ever be a fire Scorchio anymore?" "Don't worry so much, Gilbert. We'll definitely find a way out, I know we will. I have faith in us." She spoke in her ever-comforting small voice. "I will think of a way to help. You liberated me from my glass bottle prison-I'll liberate you from your Poogle prison." Ruby seemed to have been influenced by the Poogle's infectious determination. She was exceedingly resolute about coming up with a solution to poor Gilbert's problem. However, the sparkle in the faerie's young eyes seemed to be speaking of more than just pure grit. There was something mysteriously disturbing about her, as if a plan was forming in her little head. Even Gilbert could not help but notice that the faerie was of scheming enigma, something he had never seen before, and could not fathom. Nevertheless, he pushed the thought aside, although he could not help but notice that, as Ruby retired to Penny's room (where she slept), there was a troubled look on her tiny face.